Detailed two-way radio repeater base station diagnosis and upgrades | Michael Hirsch, Ph.D. The following is a detailed example of how a radio system can suffer poor performance due to initial deployment or degradations, and how they can be fixed. According to comments from repeater users in the primary coverage area, as well as Internet-connected VoIP radio users, the repeater system was not working satisfactorily. Audio dropouts on weak/fading RF signals. Excessively loud voice prompts from the repeater controller, so much so as to splatter adjacent channels due to clipped audio. Excessively loud tones for CWID, DTMF cover, etc. A significant issue addressed in another report is the intermittent RF receive performance, where several dB change of effective sensitivity is noted occurring randomly (to the negative). The audio performance was later fixed to be nearly flat by modifying a repeater controller capacitor value. Here is the pre-modification audio–very bassy. This is corrected to 0 dB at 1000 Hz. The repeater had about +3dB gain at 1000 Hz. Ideally, the passband would be a flat line at 0 dB—the data shown here is characteristic of a non-pre-emphasized transmission. 1: Audio dropouts on weak/fading RF signals. RESOLVED. The repeater controller was programmed to switch channels on the repeater, in effect turning the PL transmit on and off at certain times. One of these “off” times was during the “hang time” of the repeater, which is the period after a system user stops transmitting and before the repeater stops transmitting. This hang time is usually several seconds long to avoid excessive wear on the repeater, and to avoid having to reinitialize PL detection on all the system receiving units for each transmission, which can cause the first word to be missed in a transmission. The cause of the audio dropouts was narrowed down to the repeater not being able to handle fast, repetitive transitions in channel switching as occurred during weak and fading input RF signals. Randomly, the transmitter would get stuck NOT transmitting PL during a user’s transmission, causing the repeater to stay transmitting, but the audio to be lost. The channel changing output was thus disconnected to avoid this issue, and because PL disable is undesirable in radios systems from the 1970s onwards. 2: Excessive squelch bursts after stations unkeyed. RESOLVED. Some repeaters are not able to close the squelch quickly enough after non-reverse burst PL users have ceased transmitting. This causes a “squelch burst” of noise to be heard after each transmission. On this repeater system, this squelch burst was measured to be 50 to 150 milliseconds long. This squelch burst can be completely removed with a digital delay module such as the RLC-ADM. It was discovered that the RLC-ADM digital delay module was in the RLC controller, but was not connected to the COR line. This caused the RLC-ADM to not function fully due to it “free-running,” not knowing where to start and stop passing audio. Upon connecting the RLC-ADM to the COR line and increasing the storage time of the RLC-ADM, the RLC-ADM was observed to remove virtually all of the squelch burst, yielding less fatiguing operation for system users. 3: Audio quality of normal RF transmissions (quiet and unnatural tonality) RESOLVED. The audio passband of the repeater was checked using a digitally generated tone source as well as the repeater’s internal tone generator. It was noted that the input/output ration was not 1:1, rather, a tone going into the repeater would come out at about 75% of original strength. This caused users to have to talk louder or closer to the microphone than normal. Also, users seemed to have “pinched” audio as compared to simplex operations—some loss of fidelity is inevitable when operating through a repeater, but the audio seemed to have a notable dip in low and midrange, and a pronounced rise at high frequencies. The cause of this was identified as ungrounded audio—the audio ground on the repeater was not connected at all. This caused the impedance to be indeterminate, and the natural capacitance in the repeater and controller acted like a filter of unknown characteristics. Once the audio was appropriately grounded to the proper pin on the repeater, and an additional ground was provided for control signaling, the audio characteristics became more normal—BUT—now they appear to have the characteristics of a non-pre-emphasized repeater input—the repeater must be reconfigured for pre-emphasized audio. The RLC controller had deemphasis disabled, possibly to help the previously distorted audio, but it must have deemphasis enabled since all end users will have preemphasized audio. Now that everything else is to normal, the repeater was reconfigured to accept normal audio. 4: repeater controller voice prompts, splattering adjacent channels. RESOLVED. The Voice Prompt level was noted to be at about 4 times the level called for in the controller manual. The level was reduced by 75%, to about 2kHz as called for in the controller manual. This caused the voice prompt to be at a natural level and to not splatter adjacent channels. 5: Excessively loud tones for CWID, DTMF cover, etc RESOLVED. The Tone level was at about 3 times the level called for in the RLC controller manual, so the level was reduced by about 65% to 1.5kHz as called for in the RLC controller manual. This caused the tones to be at a more natural level and not disturbingly loud. Also, because the RLC-ADM was now properly connected, the DTMF cover tones could be disabled since the RLC-ADM mutes the tones. The cause of the very bassy audio from Internet was due to the ungrounded audio as noted in item 3. Once the ground was appropriately connected, the audio was normal except for the cause listed in item 3 that must still be resolved. 7: “Whining” noise on the audio from the Internet. RESOLVED. The whining noise came from a ground loop caused by not having a proper separate control and audio ground—the PA fan noise was being modulated. 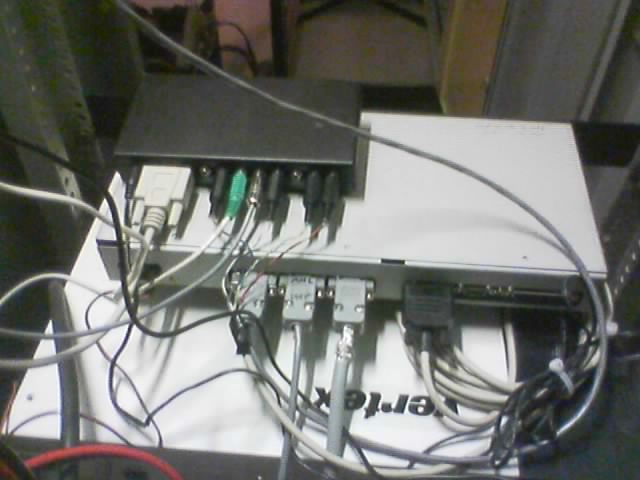 Once the repeater grounds were connected as noted in item 3, and the levels were realigned, the whining audio problem was resolved entirely. 8: Tinny (excessively high-pitched) audio to the Internet. RESOLVED. The tinny audio to the Internet was because the RLC controller has deemphasis disabled. Now that deemphasis is enabled as noted in item 3, the audio is normal to the Internet. The VXR-5000 repeater provides an analog voltage relative to received RF signal strength from about 1 to 6 Volts DC. This level exceeds the 5 Volt maximum analog input of the RLC controller. Because this function was not configured, the quickest resolve was simply to disconnect this input until a proper voltage divider would be constructed if this feature is desired at some future date. 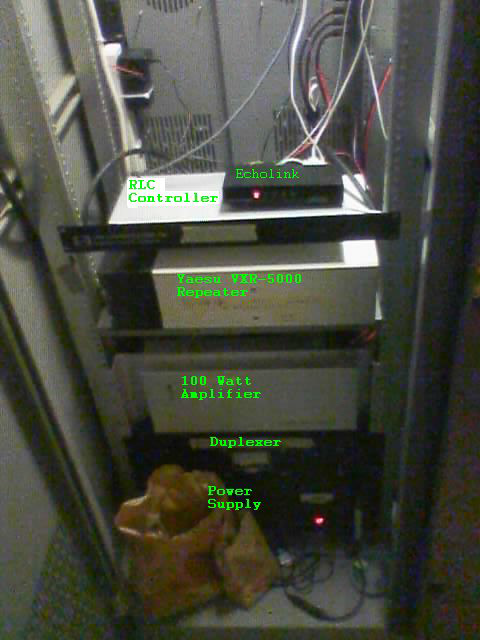 Control signals between repeater & controller were ungrounded. These issues were unexpectedly discovered while tracing the source of previously mentioned audio problems. The audio and control seemed to be finding their returns through a connection on the Analog input connection for control, analog sensing, and audio functions—obviously an undesirable situation, causing previously noted audio issues. Two ground connections were added for audio and control, which had previously been ungrounded. This resolved the audio issues noted previously and allowed the inputs and outputs to be disconnected due to previously noted undesirable characteristics.